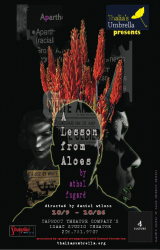 Thalia’s Umbrella opened its performance of A Lesson from Aloes by playwright Athol Fugard at Isaac Studio Theater of Taproot Theater, Greenwood, North Seattle, on 10 October, Friday. 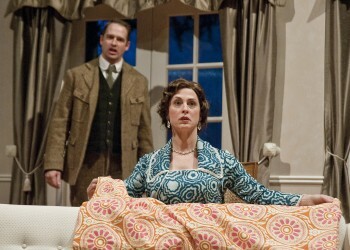 Directed by Daniel Wilson, with Terry Edward Moore, who is also the producing artistic director, as Piet, Pam Nolte as Gladys and William Hall, Jr as Steve, A Lesson from Aloes is Thalia’s Umbrella’s second production. 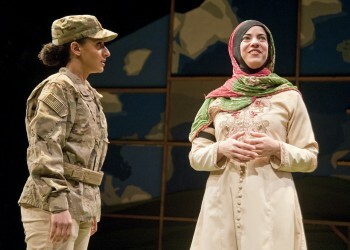 Marianne Savell in The Amish Project at Taproot Theatre. Photo by Erik Stuhaug. 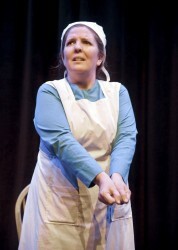 Marianne Savell excels as the sole performer in The Amish Project about the shooting of school girls at the West Nickels Mines School in Lancaster, Pennsylvania on October 2, 2006. Robert Quinlan directs this powerful fictionalized account by Jessica Dickey in the small and intimate Isaac Studio at Taproot Theatre. Isaac Studio is the right space for this, it seats 120 and with a bare set by Mark Lund of a hanging window and a simple wooden chair, it suggest the aggressive “simplicity” of the Amish as understood in our popular imagination. Mr. Pim Passes By, A.A. Milne’s drawing room comedy written in 1919, is wonderful fun from Pim’s opening entrance right up to the romantic dénouement. This is exactly the kind of show, Taproot does so well, and they are running on all cylinders here! 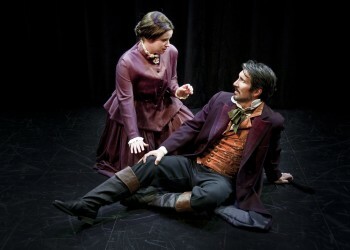 Seattle playwrights and actors Candace and Sam Vance have created a new production for the holiday season. Le Club Noel takes place in a 1930’s Parisian cabaret surrounded by the incipient stages of World War II. The Nazis are knocking on Paris’s door and it will take a great inner strength of the play’s characters to soldier on and find some genuine Christmas warmth and joy amidst the looming darkness. 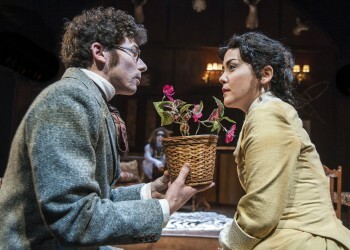 “If one could only teach the English how to talk, and the Irish how to listen, society would be quite civilized‚Äù is only one of the hilarious witticism in Oscar Wilde‚Äôs ‚ÄúAn Ideal Husband‚Äù now being staged at Taproot Theatre.